RUSH: This would be a great time to go back to Trump’s speech on Monday that I have been promising to play excerpts of all week. It was the speech Trump gave on Monday afternoon outlining his national security strategy. What this speech really was: a restatement of what the United States of America is. What this speech really was: a restatement and a repurposing for what the United States will again become. And I think juxtaposing this speech after the passage of the tax bill is a good way to expose it. We have a number of bites here. Trump started out by detailing where previous leaders of the United States had gone wrong, and it’s an echo of his inaugural speech where he stood in front of the entire Washington establishment and basically told them they had made a mess of things. THE PRESIDENT: Our leaders engaged in nation building abroad while they failed to build up and replenish our nation at home. They undercut and short-changed our men and women in uniform with inadequate resources, unstable funding, and unclear missions. They failed to insist that our often very wealthy allies pay their fair share for defense. They neglected a nuclear menace in North Korea, made a disastrously weak and incomprehensibly bad deal with Iran, and allowed terrorists such as ISIS to gain control of vast parts of territory all across the Middle East. They put American energy under lock and key. They surrendered our sovereignty to foreign bureaucrats in far-away and distant capitals. And over the profound objections of the American people, our politicians left our borders wide open. RUSH: Rat-tat-tat-tat-tat. Everything there demonstrably true, irrefutably true, an indictment of the past and, by the way, a recasting of why he was elected. “Our leaders engaged in nation building abroad while they failed to build up and replenish our nation at home. They undercut and short-changed men and women in uniform, inadequate resources, unstable funding, unclear missions.” Hello, Obama. 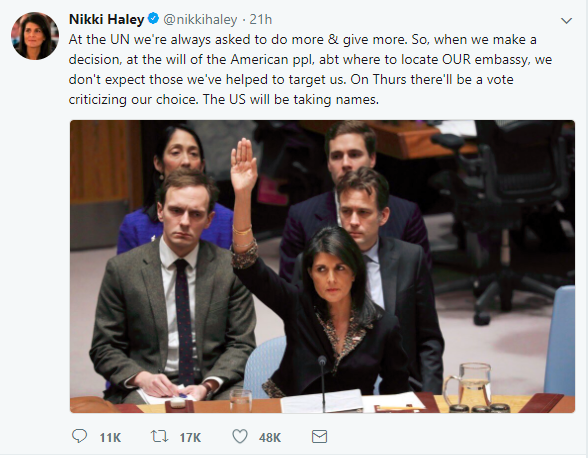 “They failed to insist that our often very wealth allies pay their fair share.” Hello, Nikki Haley this week at the U.N.
That’s changing! “They neglected a nuclear menace in North Korea.” A bunch of administrations led by the Clinton administration kicked that can down the road, did nothing about it. They made a disastrous, weak, incomprehensibly bad deal with Iran to see to it that they get nuclear weapons. Hello, Obama. At the same time, we have now learned that Obama stopped, obstructed, if you will, a DOJ investigation into Hezbollah, which was running cocaine into the United States. Obama shut that down, because Hezbollah is a foreign policy arm of Iran, didn’t want to offend Iran, wanted them to sign his deal where they get nuclear weapons in 10 years. This is such an indictment of the previous leadership in this country, it’s why he got elected. And every one of these things he has taken on and has begun to change and has begun to recast the purpose and statement of the United States of America. Here’s the next bite. THE PRESIDENT: Our leaders drifted from American principles. They lost sight of America’s destiny, and they lost their belief in American greatness. As a result, our citizens lost something as well. The people lost confidence in their government and eventually even lost confidence in their future. RUSH: Every bit of that’s true. This country has been possessed, it has been obsessed with a fatalism and a defeatism, and our leaders have told us that that’s the new norm. America in decline, both as a superpower and as an economic power. Yeah, those days are behind us. It’s now time to pay the piper. The United States was an illegitimate superpower. The United States was an unjust and immoral economic superpower because we acquired our resources in ill-gotten ways. This was the Obama administration message. Now, when he says our leaders drifted from American principles, they did, but it’s not drifted; they abandoned them. “Our leaders lost sight of America’s destiny.” No, they didn’t. They decided to change it. America’s destiny was not as American exceptionalism. American destiny was not the shining city on a hill, if you will. America’s destiny was not to rise above all nations and provide that light that attracts the best of the world to join us. That’s not what they wanted the American experiment to end up being. We were to be reduced in size and scope and to become nothing more than the next member of the world of nations. It’s not that they lost their belief in American greatness; they believed it was unjust. They believed American greatness was illegitimate! That it was acquired unfairly. I’m talking about everybody that worked in the Obama administration. Here’s the next bite. THE PRESIDENT: Optimism has surged, confidence has returned. With this new confidence, we are also bringing back clarity to our thinking. We are reasserting these fundamental truths. A nation without borders is not a nation. (applause) A nation that does not protect prosperity at home cannot protect its interests abroad. A nation that is not prepared to win a war is a nation not capable of preventing a war. A nation that is not proud of its history cannot be confident in its future. And a nation that is not certain of its values cannot summon the will to defend them. RUSH: You will not find anywhere, in conservative intellectual circles or anywhere else, you will not find a better indictment of the eight years of the Obama administration and many previous years. You have to include Hillary Clinton and her husband in this, too, because they are the same mind-set. Optimism has surged. Confidence has returned. Not in New York and not in Washington and not in the media capitals of this country, but everywhere else confidence is surging! “A nation without borders is not a nation.” Bingo. “A nation that does not protect prosperity at home cannot protect its interests abroad.” We not only didn’t protect our prosperity at home, we denigrated it. We said it was unreal. We said it was unjustified. We said it was unfair. “A nation not prepared to win a war is a nation not capable of preventing a war.” We didn’t go to war to win them, not with the Obama administration. We went to war to bog down. We went to war, in some cases, I believe, to demonstrate the futility of military power. The left is not a fan of military power. And boy, this is such a big one: “A nation not proud of its history cannot be confident in its future.” That is the Clinton administration, the Obama administration which spent a total of 16 years apologizing in one way or another for America. We would not stand up to human rights abuses in China because members of both administrations said we got no room to talk. We abuse people here. We deny lesbians and gays civil rights. We deny African-Americans civil rights. We got no rights to tell the ChiComs what to do. So we gladly, happily gave away our moral authority on a bunch of trumped-up, phony beliefs. And we had to sit here and watch every day our country being beaten down, sliced away, reduced in size, power, and scope by a bunch of people that didn’t believe in it, who wanted to transform it to become a power base for them personally. Now we’ve got somebody who believes in the American nation, believes in American greatness, believes in the American founding, shouts it proudly from the rooftops and sets about recasting it as what is normal. That the world benefits from a strong America, that the world champions America’s leadership, that America needs it and wants it, as does the world. This was a profound speech. You notice his delivery is not energetic and table pounding. It’s kind of monotoned in a way. And I think this was done by design, so that histrionics would not distract from the message. 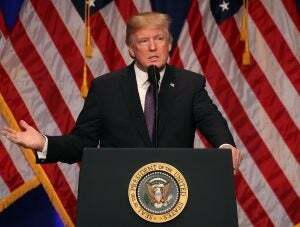 But folks, I’m telling you, there isn’t a single person in the Never Trump world, left or right, that’s beating Trump up, that’s ripping Trump, being unqualified, unfit, unsuited, an embarrassment, there’s not a single one of them that would have the guts and courage to take this country in the direction he is. There may be some, but there aren’t many that would dare try to wrest control of this country from the Washington establishment and chart a new course and take it there. Profound what is happening here, all under the belief of American exceptionalism, of American uniqueness, and American greatness. And I think something like this could only be done by somebody who’s not part of the Washington establishment, by somebody who does not subscribe to that groupthink, by somebody who does not subscribe to that political correctness, but rather has the courage and guts to remain an individual and confident in what he believes as a citizen and has believed all his life. And is willing to take on all comers no matter their status, no matter their stature, no matter their supposed importance, no matter their wealth, no matter the power they array against him, he just got up, gets up, plugs away each and every day. This is amazing, amazing teachable moment. And all it took was the passage of a piece of legislation where the party was unified. And it matters that it was tax legislation, because this is seminally, fundamentally conservative in terms of rewarding people for their work and their efforts and having them aware of it. It’s all about motivation, it’s all about inspiration, it’s all about being upbeat, optimistic, and positive. All of this can counter the last two years of nothing but pure negativism, fatalism, defeatism, lies, distortions, you name it. RUSH: Here’s one more, the finale from President Trump. Again, Monday afternoon, the speech on American security he gave. THE PRESIDENT: In America, the people govern, the people rule, and the people are sovereign. What we have built here in America is precious and unique. We must love and defend it. As long as we are proud and very proud of who we are, how we got here, and what we are fighting for to preserve, we will not fail. THE PRESIDENT: If we do all of this, if we rediscover our resolve and commit ourselves to compete and win again, then together we will leave our children and our grandchildren a nation that is stronger, better, freer, prouder, and, yes, an America that is greater than ever before. RUSH: It used to be common. It used to be how we all grew up. This used to be the America we were all told about. This is the America we were all educated about. This is the America we were all proud to be citizens of. And as the left grew in power, they began attacking the very notion of Americanism and calling it a sin, a series of sins, making it illegitimate, creating guilt where it need not exist. This is so on-the-money. “As long as we are proud of who we are, how we got here, what we’re fighting to preserve.” This is what won us World War II. This is what saw us to victory over every challenger in our history. This is the kind of stuff that bonded us together. This is what we all had in common. It doesn’t matter where you were born. It doesn’t matter our religion. It didn’t matter our economic circumstances. It didn’t matter our sexual orientation or gender. We were bound together by the belief in our country and the pride, if you will, of being Americans, the pride of being on a winning team, the pride of being on the best, the pride of being a member of the best. Not that anybody else was worse, because we used our assets to inspire. We asked others to emulate us in the hopes of making a better and more peaceful world. But then the left got hold of this country and turned it into the problem in the world. The left got hold of the universities and academia, began teaching people that America was the problem in the world and that we needed to be transformed, cut down in size, or even eliminated.